A huge congratulations to the 328 Watson Martin candidates who became CIPD qualified over the last 12 months. Your qualification will give you the confidence to take your career to the next level and guarantees you will stand out from the crowd. And to those of you who are just starting out or progressing your CIPD journey, all the best for your studies in the year ahead. With Watson Martin’s 99% pass rate across all CIPD levels you are in good hands. Our company is growing and we have strengthened the team to ensure all our candidates continue to be supported by the best HR and L&D experts in the business. But don’t take our word for it. Have a peek at the excellent reviews we get on Coursecheck to gain a flavour of the support our students receive from their advisers and the quality of our workshops. We have received over 250 reviews to date giving us a 4.5 Star rating! A warm welcome to all our new HR Apprentices! Watson Martin became a RoATP* provider in January and we are now working with large organisations and other training providers to deliver end-to-end bespoke HR Apprenticeship programmes. Check out the new pages on our website for more information on how we can help your organisation grow a talented and qualified workforce. From the latest developments in Employment Law to tips on how to be a Great Manager, our HR Learning Bites information webinar series has gone from strength to strength since its launch in April. Each session provides practical tips and advice from a Watson Martin adviser, all of whom have a wealth of HR and L&D experience. Recordings of all four webinars are available on our website along with a useful Q&A learning resource. As well as being a CIPD centre, Watson Martin offers a wide range of in-company training courses and qualifications delivered by subject matter experts and tailored to the needs of the organisation. The programmes cover a multitude of topics and are most cost effective for six or more employees from the same company. Watson Martin CIPD qualifications continue to provide great value for money. Our prices include a choice of workshops or online learning, a dedicated CIPD qualified tutor for every candidate, flexible start dates and interest free payment plans for self-funders. And if you refer a friend and they book on one of CIPD programmes, we will send you both Amazon gift cards worth up to £200. With some fantastic special offers coming up in our January sale, there has never been a better time to become CIPD qualified. For further information about CIPD qualifications, Apprenticeships or in-company courses, please contact our advisers on 020 7932 2760. We would like to take this opportunity to wish each of you a wonderful Christmas and a very bright future ahead in 2019! 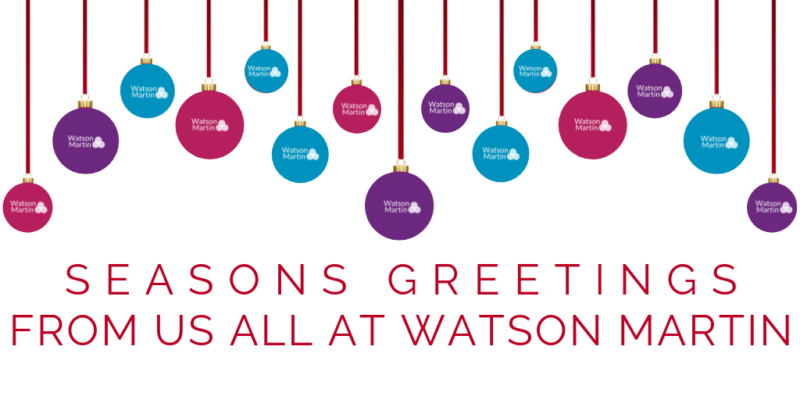 (Please note Watson Martin will be closed for the festive period from ​3pm on Monday​ 24th December and will reopen for business as usual on Wednesday 2nd January 2019). HR Professionals love our courses but don’t take our word for it! CIPD Sale 2019: Learn more. Spend less.